Design & Construction: The Heartbeats At Home Elite Digital Fetal Doppler was designed with comfort and durability in mind. Its compact size makes it easy to control and is comfortable in your hands. The durable case and reinforced probe arms provide maximum circuitry and probe protection. The probe is silky smooth and designed for superior comfort. Even the buttons were ergonomically engineered and built for years of service. Sound Quality: The static suppression technology, probe design and speaker system all work in concert with each other to help produce the highest quality sound output... 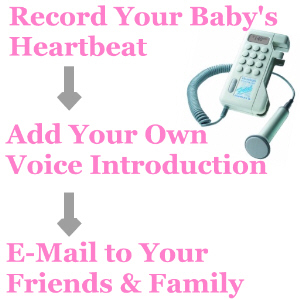 The result - Your baby's heartbeat will be loud and clear! Large Digital LCD Screen: The LCD screen built into the Heartbeats At Home Digital Fetal Doppler is one of the largest you will find on a hand-held doppler. It's also bright and easy to read. The LCD screen displays both the heart rate per minute plus the battery strength. Recording: All our dopplers are fully capable of capturing heartbeat sounds through a direct connection to your computer (PC or Mac). By using your mic and Sound Recorder, you can even record a personal voice introduction along with your heartbeat recording. Once captured, the audio file can be e-mailed to anyone, archived in your computer or burned to a CD. The fetal heartbeat is much faster than an adult heartbeat and sounds similar to the "clippity-clop" of a galloping horse. 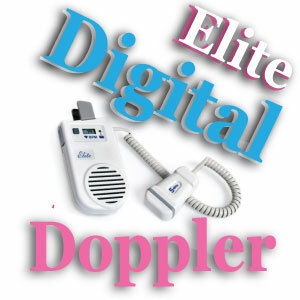 With this doppler the fetal heartbeat can be heard as early as 8-10 weeks into the pregnancy. A word about safety...Ultrasonic Dopplers have been in use since the late 1950''s to detect the fetal heartbeats in earlier stages of pregnancy, long before an ordinary stethoscope. It is important to note that there are no known reports of any adverse biological or health effects from the use of our Fetal Dopplers. With your doctor's approval, the FDA has cleared the in-home use of Heartbeats At Home Fetal Dopplers to listen to the baby's heartbeat during pregnancy.